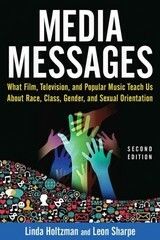 Media Messages 2 Edition The new edition of this widely adopted book reveals how the popular media contribute to widespread myths and misunderstanding about cultural diversity. While focused on the impact of television, feature film, and popular music, the authors reach far beyond media to explore how our understanding, values, and beliefs about race, class, gender and sexual orientation are constructed. They analyze how personal histories, combined with the collective history of oppression and liberation, contribute to stereotypes and misinformation, as well as how personal engagement with media can impact prospects for individual and social freedom. Along with updated media examples, expanded theories and analysis, this edition explores even more deeply the coverage of race in two chapters, discusses more broadly how men and boys are depicted in the media and socialized, and how class issues have become even more visible since the Great Recession of the 21st century and the Occupy movements. Special activities and exercises are provided in the book and an online Instructor's Manual is available to adopters.